We love, LOVE this recipe. I’ve tweaked it along the way and can now say these are officially our favorite pancakes. (Just fyi, these are our favorite waffles.) This post is going straight into the favorite recipes section. I made these pancakes for a trip with my girlfriends last month. I brought the flour/measured dry ingredients in a double ziploc bag in my suitcase and it was well-worth the effort. 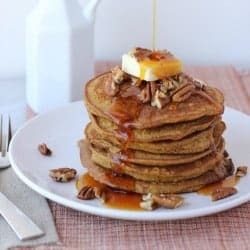 These pancakes are gluten-free, but I moreso consider them unique pancakes made with different kinds of flours. Everyone loved them! I use my grain-free flour blend that I’ve been loving in everything lately. 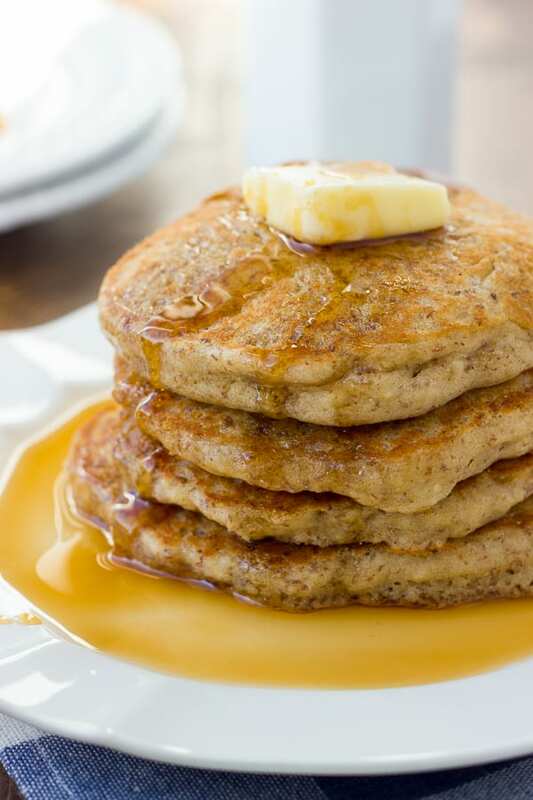 The buckwheat gives the pancakes nice texture, while the almond flour lends a slight nutty flavor. The potato starch and arrowroot powder make these fluffy. 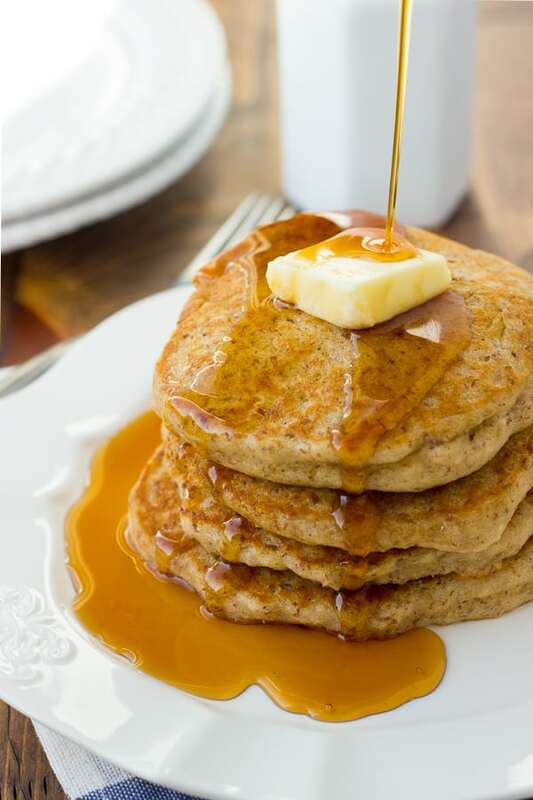 Paired with nutritious ground flaxseed and the slight sweetness from applesauce, these pancakes are perfection! We add chocolate chips and bananas to ours. My husband likes them plain best. I bet they would also be fabulous with blueberries. Enjoy! Whisk together the dry ingredients until incorporated. In a separate bowl mix together the wet ingredients, breaking up the egg to totally combine. Add the wet ingredients to the dry and stir with a rubber spatula or spoon to totally combine. Heat a non-stick skillet over medium-high heat until hot. Add a 1-2 tablespoons of butter and swirl until it sizzles. Scoop out 1/4 cup batter into the hot pan and smooth to flatten slightly with an offset spatula or butter knife. Cook on one side until golden, about 2-3 minutes. Flip and cook for another 2-3 minutes on the other side. These are best right out of the skillet. Serve with butter and warm maple syrup. Enjoy! This is by far the best GF pancakes I have made. I have been searching for a GF flour blend that is rice free with minimum starches and no gums. 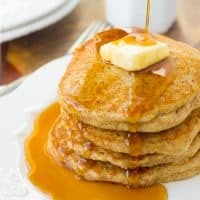 These pancakes taste, look and cook just like regular flour pancakes. My kiddos, hubby and mother all agreed they were amazing. Try these with strawberries and maple syrup. You will not be disappointed. 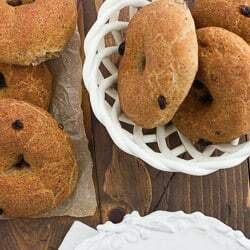 I am off to buy buckwheat grouts to make bagels. You are AMAZING!!!!!!! Thanks for commenting back with the results! I’m so glad you like them! would these work well with oil instead of butter? I make my sunflower flour in a coffee grinder – I can not do almond flour as well and this is what I use in its place and it works well. Yes, these is a great recipe. 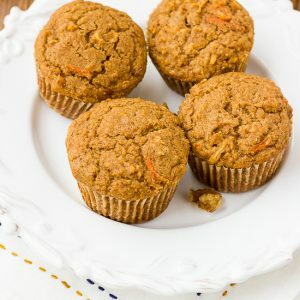 The best gluten-free grain-free recipe I’ve ever tried. Even at 8,500′ high in the Rockies, fantastic. I’m glad you like the pancakes! They are our favorite too! Amazing! First GF pancakes I’ve made that haven’t had a soggy gluey middle! And bonus they have no rice flour and healthy too! !